I am happy to announce a comment contest! Say hello via comment by 10/13 at 11:59. 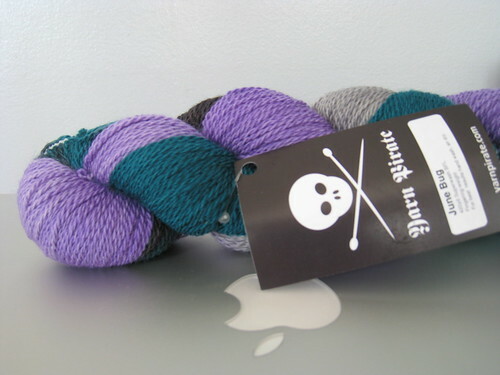 You’ll be entered into a random drawing for this lovely skein of Yarn Pirate in the June Bug colorway. Every comment I’ve ever received on all posts since January 22, 2007 will be entered into the drawing, so if you’ve never commented before, now’s your chance. Anonymous comments and those from family will not be eligible (sorry Mom and TAS). I will select the winner by random integer generation and make every good-faith attempt to notify by email, as well as make the announcement in a blog post on 10/14/2008 at 9 am. Winner will have one week to claim the prize. After one week, I will draw a new winner. Thanks to all my regular readers, and those that pass through.